New gas mega-wells threaten to strain contractor fleet. This article appears in the April 2009 issue of Alberta Oil magazine. The graphic compares natural gas production from a conventional sandstone reservoir to fracced, unconventional production. If unconventional natural gas is a revolution in the making, so are the services required to make it happen. Industry spending patterns are shifting, with much bigger investments now being poured into operations below the ground. Traditional ways of doing business are changing. Multiple wells are drilled from single sites, known as “pads,” to tap the new gas target. The old oilfield rhythm of busy winters and quiet summers is also changing as work grows in the warm seasons. Despite the economic downturn, there is even a hint of a gas counterpart to the former oil sands labor shortage in the air. There is a risk that in the near future Western Canada will find itself short of powerful hydraulic equipment needed to make the networks of underground channels that make unconventional gas deposits flow. This would be a blow to exploration and production companies, but possibly a considerable financial boon to service companies with the right stuff to do the rock fracturing, a field known as “fraccing” in the industry. The specialty is a well stimulation technique which improves production from geological formations where natural flow is restricted. 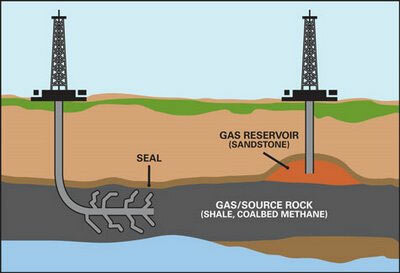 Hydraulic fracturing pushes a mix of water, sand and some soluble chemicals into well bores at high pressure, both to spread cracks across the formation and hold them open for gas and oil to flow. The technique is a powerful production tool. “This breaks up a lot of rock, making a lot more gas available. These new technologies are enabling us to access a whole lot more low-permeability [poorly flowing] rock than you would ever be able to reach with a vertical well,” Russum says. In the old days of vertical drilling, producers generally fracced just one or two zones per well. With today’s technology, it is possible to frac a single well up to 17 times. A well that requires so much work would likely have a horizontal reach of 3,000 metres or more. Analyst Kevin Lo of FirstEnergy Capital Corp. estimates that fraccing just one of EnCana Corp.’s Horn River shale gas wells in northeastern British Columbia requires a crew equipped with more than 30,000 horsepower of compression. In Western Canada, there is perhaps 800,000 horsepower available. “We do not believe that there will be sufficient capacity to perform all of the jobs necessary” if B.C.’s Horn River and Montney shale gas drilling hot spots grow, Lo says in a research note. He also worries about the heavy lifting required to deliver enough fraccing materials. Fracturing a single horizontal well in the new unconventional gas reservoirs can require up to two thousand tonnes of sand. The Trican executive predicts, “There will be shortages of equipment when we get up to full development of the shales.” If it happens, the squeeze will be a plus for service companies like his, which will then charge premium day rates, but a worry for the gas producers in the region. Environmentalists have voiced concern that fraccing chemicals may contaminate groundwater. But Dusterhoft says that, before wells are fracced, the formations are securely sealed away from potential fresh-water reservoirs. Use of chemicals is also limited in the unconventional wells in northeastern B.C. “We only use a polymer as a friction reducer, and maybe something to stabilize the clays. Mostly we just run water and sand,” Dusterhoft says. Huge fraccing jobs in northeastern B.C. require vast logistical support. Each well can require 2,000 to 3,000 tonnes of fine-grained sand. Parades of trucks deliver vast harvests of ancient sand mined from fossil beaches, often from quarries in Saskatchewan. Such a project may require a 40-member crew, operating 20 or more hydraulic compression systems mounted on large fraccing trucks. High volumes of water are also used. A typical job requires a large water storage pit in addition to a string of high-volume steel tanks. The amount of water being used in these jobs has contributed to the developing seasonal shift in the fraccing business. “Now the industry is drilling during winter freeze-up, as we always have, but fraccing in the summer. All the bigger operators are trending in that direction,” Dusterhoft reports. Water is easier to handle in warmer weather. In the longer term, the changing work pattern will require upgrading to all-weather roads to Horn River and Montney. Until those improvements are completed, service companies have to leave equipment in the area during freeze-up. The shift to unconventional gas occurred much more quickly than anyone expected, Dusterhoft says. Among numerous implications of the switch, an old barometer of industry health –the sheer number of wells drilled – is becoming obsolete. The production change, while increasing oilfield work, is contributing to a reduction in the total number of Canadian wells being drilled. In 2008, nearly 40 per cent of the wells involved horizontal or directional drilling – twice the level of 10 years ago. For the first time, FirstEnergy Capital said in a recent research note, the number of horizontal wells across reservoirs will soon match the number directionally drilled at angles. Greater proportions of industry spending on wells are going into completion services like fraccing. Unconventional gas operations are not cheap. Drilling costs are in the range of $5 million to $7 million per well at Horn River, and $4 million to $5 million at Montney. Fraccing costs are estimated to be $2 million to $3 million per well. But the production profiles for these wells make them worth their costs. Each may produce 7.5 million cubic feet of gas per day in their first year. Production declines rapidly but typically levels off at around two million cubic feet per day then stays steady for years. When gas prices improve, the new wells will be cash registers.